Is your closet full of neckties? Have you been saving the ties of someone special? Do you have a bunch? Is the fabric calling to you? Do you want to see them to bring back memories? Are you thinking Free Fabric? Learn what to do with them. Techniques for taking them apart (deconstructing), washing and stabilizing will get you ready to use them. Come see quilts, pillows, table runners and objects d’art using these wonderful personal unique fabrics. Feel free to bring one of your own and learn to fillet your tie. There will be a workshop Saturday, October 17th. This will cover pressing and piecing with non-traditional quilting fabrics. Students make 8” or 12” Starry Path blocks, using freezer paper for pillow, wall hanging, or table runner. 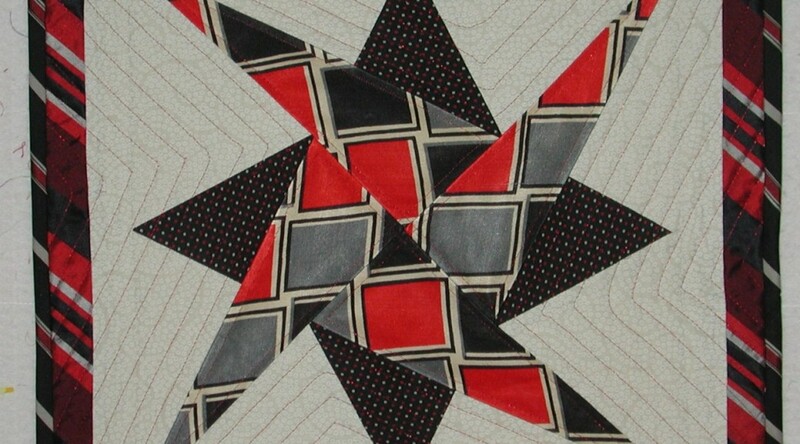 A kit for $ 5.00 includes patterns to construct either the large 12” or smaller 8” blocks. Finished size will be determined by the number and arrangement of blocks. Hopefully, I will not need to repeat my mantra: Your mom told you there is “NO FREE LUNCH”. When you look at the box of neckties, remember those words. Free fabric implies that no money changed hands. This free fabric requires an investment of “sweat equity”. That disclaimer repeated again, everyone will get ready to enjoy using those small slippery, cut on the bias, not intended for handling, used fabrics. Before class, students will need to deconstruct their ties. The following lists the procedure. • Open seam. Clip tacking at both ends. • Beginning at the smaller end of the tie, find the thickish thread that runs the length of the tie. Pull. • Remove interfacing. (If saving, ask yourself, why?) Leave the lining on tie. • Press on wrong side. Cover the ironing board with towel. Next PostHow Many Ties Will I Need for Starry Path Block? Sounds like a great class! How Many Ties Will I Need for Starry Path Block? FIFA 17 on How Many Ties Will I Need for Starry Path Block? dancome on How Many Ties Will I Need for Starry Path Block? debbie McHolick on How Many Ties Will I Need for Starry Path Block?